A ring that was lost in 1972 was found last week by Windy City Detector Sales and Rental Inc. James Murphy holds up the ring. Windy City Detector Sales and Rental Inc.
BEVERLY — James Murphy Sr. never gave up hope believing he'd find the 1970 high school class ring he lost in 1972. 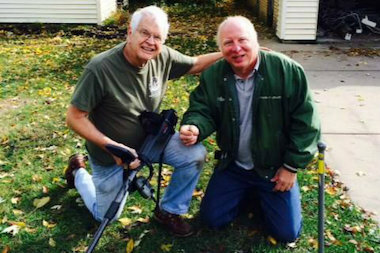 Friday, with assistance from a Northwest Side man operating a metal detector, the gold ring was discovered at the same Beverly home where it originally slipped off the ring finger of Murphy's left hand. "It drove me crazy for more than 40 years," said Murphy, 62, a retired Chicago Police officer who now lives in Mount Greenwood. "I knew it was in that yard. I'm in shock still." On Wednesday, Murphy called Ron Shore, owner of Norwood Park-based Windy City Detector Sales & Rental, Inc., which helps customers find long-lost items. Shore referred Murphy to Jim Evans, an actor who in his spare time conducts "search missions" throughout the Chicago area to look for anything from diamond-studded earrings to car keys lost in the snow. "Seventy percent of my calls are from what I refer to as anger management issues, where the wife gets upset with the husband and chucks her ring and then regrets it," Evans, of Old Irving Park, said with a laugh. 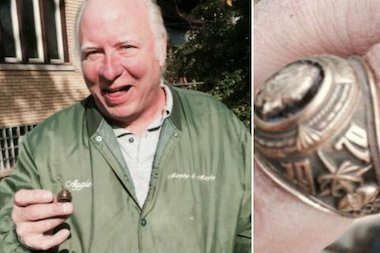 Murphy has regretted losing his 1970 senior class ring from St. Bonaventure High School — a private school in Wisconsin — since it disappeared on a September afternoon in 1972. That day Murphy was washing his brand-new, metallic dark green Ford Pinto in preparation for a date when he dipped his hand in soapy water and then flung his hand in the air. When he did, the ring went flying as well. He heard two dings and then nothing. For two full days, he searched every part of the front yard of the Beverly house his grandfather built in 1926 and where Murphy lived from 1952-73. No ring was found. "I had worn that ring every day," Murphy said. "It was my pride and joy." The house was sold in 1973 and Murphy said the owner wouldn't let him conduct further searches. But earlier this year, it was sold again, and this time, the new owner was accommodating to his wishes. On Friday, Evans met Murphy at the house, asked him exactly where he was when the ring went missing, and then set up a 10-square-foot search grid with strings attached to stakes. Within 10 minutes, Evans located a metal button, a rusty nail, and then, buried six inches in the ground, Murphy's ring, which was hidden in a clump of mud. "I hugged everybody I could find," Murphy said. Evans charged Murphy $50 for the visit, and Murphy gave him $100 for finding the ring because that's all he had on him. He plans to send him another $100 soon. "I love this guy," Murphy said. "I'm still as high as a kite." Shore said the key to locating lost items is to look for them right away. So he was shocked and thrilled Murphy's treasured class ring was found after more than four decades. "When he told me he lost it in 1972, it was a stretch that it would be found," said Shore, who noted rings and other objects have a tendency to sink into the ground after a significant amount of time. Murphy on Saturday took the ring to a jeweler, who cleaned and polished it. And Murphy, who now has the jewelry back on his left ring finger, doesn't plan to ever lose it again. "This ain't coming off again," he said. "Maybe I'll Krazy Glue it on."